The Speech is a transcript from 2010 of Bernie Sanders’ 8 hour attempt to talk the senate out of approving a deal, “Tax Relief, Unemployment Insurance Reauthorization, and Job Creation Act of 2010”, which would give massive tax breaks to the already “fabulously wealthy”, while mostly just paying lip-service to the struggling middle class. 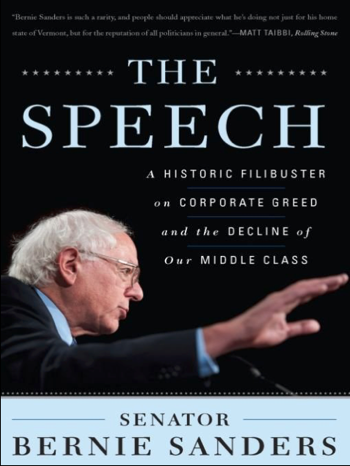 “A Historic Filibuster on Corporate Greed and the Decline of Our Middle Class”, goes the tagline. And reasonably so; almost no politicians were, or are, willing to speak out against corporate greed, or willing to disavow the morally bankrupt strings-attached to the support of the ridiculously wealthy. So Bernie didn’t pull it off. It passed into law 81 to 19. Ouch, for the people. But damn if he didn’t put up a good fight. Now, for 2016, Bernie is running for president. He’s fighting an almost identical battle, like he’s been doing for decades. And almost anyone who’s really paying attention (and not making gobs of money from the status quo) really, really wants him to win. The Speech lasted 8 hours, and if you’re so inclined, you can watch the entire thing here. But reading is faster than listening, so I grabbed the book. If you’ve spent any amount of time googling Bernie Sanders, you won’t find mud-slinging. You won’t find dubious connections to corporate interests. What you’ll find are decades worth of attempts to fight for regular working americans. Marginalized americans. Minority Americans. Families and women. Like this video from 1988 where he’s campaigning on behalf of a black presidential candidate. Or this video from 1995 where he tears into California Representative Duke Cunningham for referring to gay soldiers as “homos”. Just type in “Bernie Sanders” and any year in the last 4 decades, and you’ll find something. Something startlingly similar to what you might here today on his campaign trail. Among his followers, Bernie is known for staying fiercely on-topic, for rejecting the shenanigans, for focusing on the issues, even when no one seems to be listening. I’ve heard the sound bites. I’ve watched him speak. I’ve seen his campaign advertisements. And while some politicians will put their foot in their mouth as soon as they go off-script, as soon as they have to think for themselves, Bernie only seems to get better the more he talks. I wanted to test this out—I wanted to see what Bernie would say when he just has to keep talking and talking and talking. What happens is inspiration, and a good dose of repetition. For some people, Bernie’s candor on the issues comes across as ‘nuts’, but not what he’s actually saying or doing. In an 8 hour speech, he says nothing that marginalizes the people, that demonizes and group of working class people, that obscures facts. Nothing that would make an ordinary American say “hey that’s not fair to me!”. But he is not shy to call Wall Street greedy, which it is. He is not shy to call out the Walton Family for lobbying for bigger and bigger tax breaks for themselves, and fewer and fewer worker protections. Bernie Sanders is ‘nuts’ in as much as the American people are ‘nuts’ in their own paltry little, not-mega-wealthy, opinions. Bernie is ‘nuts’ in the same way that someone who stands between a bully and his victim is nuts, that is to say he’s doing the right thing by the people who have elected him, and never the highest bidder. That doesn’t sound ‘nuts’ to me. It sounds difficult, courageous and absolutely necessary. Reading The Speech, you get the sense that Bernie still hasn’t compromised his ideals. What he says is exactly in line with the long history of political battles that he’s made it his mission to fight since the beginning. He hasn’t backed down. He hasn’t adopted gimmicks to win, or gotten in bed with corporate interests. If you’d like to know who Bernie Sanders is—what kind of politician he really is—The Speech provides hours of off the cuff speaking. I dare you to find something in there that you, someone making less than 50 million dollars a year, actually disagrees with on the merits of what he’s saying. We’re so used to the lack of integrity that cross-party politics are near impossible—we don’t think virtually any politician actually believes what they’re saying. We think all of it is lip service, and most of it is. But not Bernie Sanders. He’s about the only politician who’s uncompromisingly proven his values are his own for decades. He’s not rich. He’s not polished. His speech writers, if even has them, weren’t recently writing copy for JP Morgan. He’s the real deal. The real deal. And if the deluge of video clips from the senate floor do not convince you, The Speech might. You can learn more about Bernie Sanders and where he stands at feelthebern.org, or you can get involved at BernieSanders.com. Scratch that, you should get involved. Bernie Sander’s campaign is not just about the issues that he is passionate about, you can disagree with those, but Bernie is still your best candidate. Bernie’s campaign is fundamentally about giving the power of the vote back to the people. If we want our politicians to care what we think, we have to elect one who does care what we think. If the people in power don’t care, then whether you agree with them or not doesn’t actually matter. They’re just going to do what they want, what their big donors want. But voting for someone who disagrees with you, but does care what you think, creates a genuine opportunity to change in the way you think is necessary. To build on democracy not worming our way around oligarchy.